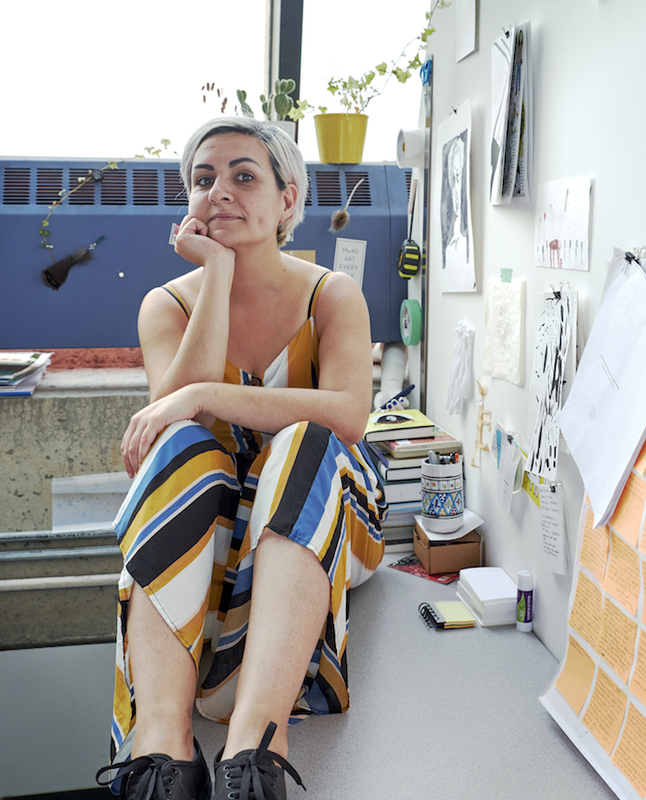 Naz Rahbar is a Toronto-based multidisciplinary artist, educator and entrepreneur. Naz says her passion and drive to create is more like an urge, something she doesn’t know how to not do. A maker for as long as she can remember, Naz has explored art in object-form as well as projects based in time, performance and community. We chat with Naz about the art she creates, which is often autobiographical and narrative in nature, as well as her ventures as a business-owner and teacher, allowing students of all ages to explore the act of creating. Read our full interview with Naz below for the full story. You have experience creating via various mediums, including through drawing, prints, handmade books, performance and installation. Why have you chosen these methods to showcase your artwork? I like each of those mediums or methods for different reasons. I guess some of these mediums lend themselves well to storytelling and narrative, or they can be sequential. I think that drawing is really the core of my practice, and the thread through everything I do. It’s not only a visual art medium, sometimes more of a time-based medium, with a performative aspect. In many ways, I feel closer to music and theatre than painting. I also really love animation and have been experimenting with that a little bit. The art you create often highlights dilemmas with identity and human existence. These are not simple themes to consider. Why are they so significant for you? Perhaps it’s my way of working through things and understanding how I extend into the world. I feel like my history is complicated, but the narratives aren’t only mine. They are also social and, with or without intention, political. You share some of the work you produce on Instagram. What type of process do you follow before deciding which piece you want to highlight on social media? I think I’m actually kind of random about it! Sometimes when I’m leaving the studio, I like to take a few snapshots of what I did that day or what I have on the walls. I am trying to be more consistent, but that’s not how real life works. A lot of artists don’t show any work online before they actually physically show the work. I really enjoy having a platform without needing a physical space and the ability to show the work in relation to my day to day life, with less borders and boundaries. You came to Canada from Iran in 1997 at 14-years-old. What prompted your move? The short answer would be for political reasons and basic human rights. Life in Iran has been increasingly difficult since the 1979 revolution. Since then, many Iranians have fled all over the world as immigrants and refugees. My family is one of many. I was just an angry 14-year-old who didn’t want to leave her friends and cousins and things, and I didn’t have a choice. What is one of your earliest memories of life in Canada? I actually have a great memory, because we came here on Halloween day. We were staying with family friends who had kids, and they took me trick or treating with them. Schools were on strike and closed for a couple of weeks, so we stayed home, ate junk food and watched television. My 14-year-old self thought that was fabulous! How have your experiences in Canada changed since you came to this country, over 20 years ago? Life has many of ups and downs. I have been growing up and old, and Toronto has been changing a lot. I guess I feel more at home here now. I have been here more than half my life. I feel like a foreigner less often. In 2009, you graduated from the Ontario College of Art and Design (OCAD), majoring in drawing and painting and minoring in printmaking. What is a lesson you learned while at OCAD that you still practice and keep in mind today? That would be to make friends and keep in touch with your profs and peers. They will become your colleagues. The art world is a small world. In 2012, you also graduated from York University with a Bachelor of Education, with a focus in fine arts. How did this step impact the course of your career? I had already been working with kids and teaching for a while before I completed this program. I wanted to establish a more professional teaching practice. It gave me more teaching opportunities and opened more doors. I also met wonderful people who are still in my life. I always knew I didn’t want to teach full time or be in the studio full time. It’s certainly a juggling act, however I am learning more and more that all these things I do are not separate things. They are actually all the same, and feed into one another. Whether they are in a classroom, studio or public space. Currently, you’re a Master of Fine Arts candidate, also at York. What have you chosen to focus your studies on? And why? So far, a lot of my work and research is about bodily dwelling, identity, time and space. I had been pretty busy with teaching and felt the need to dedicate more time to my art practice. Having regular studio visits with other artists and a supervisory committee has really helped me move forward. Feedback is so valuable! You’ve also been working in education since 2005. What has your work in education entailed? Why are you so committed to this industry? Honestly, it helps me keep it real. Teaching also requires a lot of observation and reflection, like art. A prof on the first day of teacher’s college said to us, “Teaching is a calling.” If making artwork is an urge for me, I can say that teaching is my calling. Plus, I always say, the learning goes both ways. I learn so much from the people I teach, especially the students. I have taught workshops and classes to adults, youth, school-age kids and preschoolers, in large groups, small groups and in different settings like schools, studios and camps. I have enjoyed most of these experiences and I enjoy teaching all age groups. Curriculum development and programing is something I also really, really enjoy about working in education. In addition to all that we’ve chatted about so far, you are also the Co-Founder and Director of ArtCave, located in Toronto’s east end. In 280-characters (a tweet! ), please describe ArtCave. ArtCave is an art studio and collective of professional artists and educators, founded in 2013, offering visual art classes and workshops for kids, youth and adults. Why were you compelled to create a collective that focuses on equitable and creative art education and community building? Art is not something that is accessible for everyone, or always available in school. Studio time is an important time, like play time. Having a positive and safe space to have a creative outlet can really help individuals and the community. Sometimes you just have to make that space. When did ArtCave officially launch? How has the initiative grown or changed since you first opened your doors? In 2013, my friend Nilou and I started ArtCave, thinking we wanted a studio space to work and a different setting [in which] to teach. Danforth East is my home. Some kids have been with us since we started and it’s a joy to continuously work with them and to watch them grow as people and artists. Additionally, I’m starting a Queer Youth group art meet-up this year and I’m super stoked about that. In 2017, ArtCave hosted a community animation festival and workshops in partnership with the City of Toronto’s cultural hot spot program. Each year with ArtCave has been different and better than the last. Who are the students that attend ArtCave programs? How do you hope ArtCave benefits them? Mostly local kids and teens. We aim to create an inclusive and positive learning space for them. We want them to enjoy their time, stretch their imagination, learn something, make friends and be proud of themselves. ArtCave is located in Toronto’s east end. Why did you choose to set up shop here? It was really by chance. We had been looking for a while and couldn’t find anything we could afford. Our real-estate agent insisted on showing us this one last spot, and it was ArtCave! We knew it as soon as we saw it. Danforth East certainly wasn’t as up and coming five years ago as it is now. We feel lucky to be where we are. How can you not love The Danforth? How do you manage all of the projects that you have on the go? Do you have time to sleep?! Hahaha, sometimes I don’t! But I just have to remind myself that this is what I chose, this is what I wanted. And most of the time I am so thankful to be doing what I love. It does become a juggling act at times, but I love doing different things and not a regular 9-5. I love that each day is different. One day I’m drawing with five-year-olds in the studio, one day I’m teaching teens and some days I’m alone in the studio. It helps to have a lot of lists and a planner to use religiously! It has taken some time but learning to know when you need a break is also super important. I don’t remember the last time I was bored. Might you have any advice for other entrepreneurs and creatives hoping to delve into new things? Fun facts: My cat’s name is Butchie. She doesn’t care for catnip and her meow is more of a tiny quiet growl. She also does a trick for treats. I’m a Capricorn and I really do identify with the mountain goat. Thank you Naz for sharing your story with A Quarter Young. For more about Naz, follow her on Instagram at @naz.rahbar and visit her website nazrahbar.ca. The feature photo is by B.K.